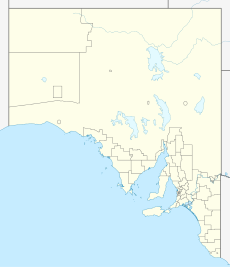 Warburto is located within the federal division of Grey, the state electoral district of Narungga and the local government area of the Copper Coast Council. The boundaries of the gazetted locality were created in January 1999. As of 2014, land use within the locality consisted of agriculture being the major use, followed by conservation including the Bird Islands Conservation Park. In August 2014, sections were severed and added to the localities of Cross Roads, North Moonta and Paramatta to "better align postal delivery and to reflect historical associations". There was once a Warburto railway station on the former Wallaroo railway line. ^ a b c d e "Search result for "Warburto (Locality Bounded)" (Record no SA0038073)". Department of Planning, Transport and Infrastructure. Retrieved 6 April 2016. ^ Australian Bureau of Statistics (31 October 2012). "Warburto". 2011 Census QuickStats. Retrieved 27 February 2016. ^ a b c "Warburto, South Australia (Postcode)". postcodes-australia.com. Retrieved 6 April 2016. ^ a b c "Search result for "Warburto (Locality Bounded)" (Record no SA0038073) with the following layers being selected - "Suburbs and Localities", "Local Government Areas" and "Road Labels"". Department of Planning, Transport and Infrastructure. Retrieved 6 April 2016. ^ "Monthly climate statistics: Summary statistics KADINA AWS (nearest station)". Commonwealth of Australia , Bureau of Meteorology. Retrieved 6 April 2016. ^ "Development Plan - Copper Coast Council Consolidated – 28 August 2014" (PDF). Department of Planning, Transport and Infrastructure. pp. 119, 187, 285, 290, 286, 302 & 304. Retrieved 6 April 2016. ^ "Search result(s) for Warburto, 5556". Location SA Map Viewer. Government of South Australia. Retrieved 6 April 2016. ^ "Search result(s) for Warburto Railway Station". Location SA Map Viewer. Government of South Australia. Retrieved 6 April 2016. This page was last edited on 3 March 2018, at 06:04 (UTC).